ATT sent the update icon 5G (E) icon. I'll post a screenshot of when I'm in one of those areas. Will you post a screenshot of what the 5G icon looks like? What android device do you have? Running which version of android? this wouldn't be that fake 5G that I've been hearing about lately ?? Yes it is. Live and local! Like a Dodge truck with the muffler removed. All noise and no performance. My S9+ just got the notification for an update, and it's a big one. Taking forever to download. My wife's V30 (AT&T variant) got it a week or so ago. The phone is so much faster and buttery-smooth now compared to before. Sadly my V35 (Amazon version) doesn't get the new logo, I'm feeling left out. I'm downloading too. 5Ge will be in the build. Is your download crawling too? Mine is just now to 344Mb downloaded. 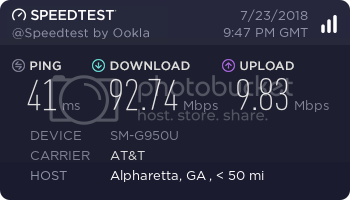 I'm on my 100mbps home internet so it must be server side. Post If You Got The OTA Update? If you have/used the vx-8000 can u tell me what you think? V60: Post Sites That Give Ringtones Thru Pressing Or If You Have Tones !!! !